If you didn’t already know, Popsockets have become the most popular phone grips/holders/stands on the market today. Simply scroll through your social media feeds and you’ll see celebrities like Serena Williams, Kylie Jenner, Michael Phelps, Ryan Seacrest and Jared Leto posting pics with PopSockets in hand. What else? This amazing accessory has its own hashtag! The Internet has a new term for the custom popsockets: expanding magic! They feature a rinsable, repositionable gel that enables them to stick to most surfaces including cases and devices. They can also serve as a grip for your phone, making it easy to transport and serving as a perfect base when taking pictures. They’re so popular now that if you just walk down the street or go to a park or mall, you’ll be sure to see somebody with a PopSocket on the back of their phone. It’s easy to see why companies have jumped at the opportunity to make Custom Popsockets a part of their marketing strategy. Sure, we know how the world of technology has conditioned us so that we are constantly looking at our phones. In fact, the average person looks at their phone 46 times a day! Therefore, it just makes sense to put your logo in a place where people are sure to see it several times each day. Popsockets are typically sold individually for $10 or more. But by buying in bulk, you can get Promotional Popsockets for under $5 and they’ll make great gifts and useful giveaways that have a branding impact. 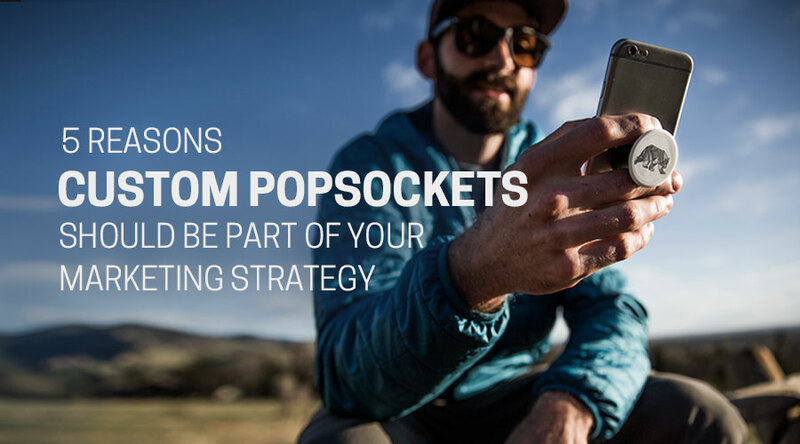 Those without a Popsocket will be sure to use yours rather than go out and buy their own. Considering this is a handy product that people will actually use and enjoy, this guarantees that your custom Popsockets will be serving its practical and marketing purposes. Let’s face it; today, when we see someone in public, they often have their phones out. If their phones have your custom popsocket attached to it, that means that not only do they see your logo, but anyone who sees their phone will see your logo as well. This is the kind of maximum exposure your company needs. The most important part of selecting a promotional product is determining the usefulness and impact they will have. Logos are often put on pencils, bookmarks or even buttons or pins. Over time, these products will break or get lost or thrown out. Because Popsockets are a useful, durable product, your clients or employees will be happy to use them for a long time. Therefore, your advertising will also have a long lasting investment. A win-win for everyone. iPromo Custom PopSockets from iPromo on Vimeo. After using Popsockets, many customers say they will never go back to using their phone without one. Therefore, the likelihood is high that they will put your custom Popsocket on their phone and keep it there for a long time. If you are looking for a way to promote your product or service, custom Popsockets are the way to go. They are useful products that people will love and featuring your logo on one of them guarantees maximum visibility for your company. People are pretty attached to their phones. Why not cash in on this technology by ordering your custom Popsockets today? In the world of business, it takes out of the box ideas to make your company stand out from the competition. Putting a logo on a useful item is a great way to get your name out there. This tried and true method has stood the test of time but can be updated when we think of adding logos to modern, trendy products. iPromo is a promotional company that can put your logo on just about anything. Find out why their custom Popsockets can be a great part of your marketing strategy. You can order them online today or you can live chat or call us (888) 994-7766 for additional details or to get a free custom quote and virtual preview with your logo. Promotional Products, How Well Do They Really Work?